Sophie Schillaci of “Entertainment Tonight” joins CBSN with more on the passing of Tom Petty. The musician was 66 years old. 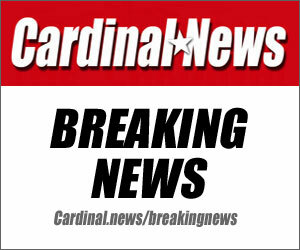 UPDATE: Tom Petty died peacefully at 8:40 p.m. PDT surrounded by family, his bandmates and friends. UPDATE: According to TMZ, Petty was put on life support at UCLA Santa Monica Hospital, then taken off, since his family has a do not resuscitate (DNR) order in place. 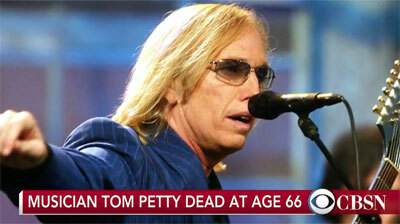 At this time, Petty is still alive, but is not expected to live through the day, TMZ reports. Tom Petty, age 66, was reportedly found unresponsive and not breathing at his home in California Sunday night, October 1, 2017 and rushed to UCLA Santa Monica Hospital, after Los Angeles County Fire Department paramedics were dispatched about 10:45 p.m. Petty was reportedly taken off of life support after he was found unconscious in his California home on Sunday. Petty regained a pulse, but an EEG test showed no brain activity. Petty is reported dead of a heart attack on Monday, October 2, 2017. Florida native Tom Petty rose to fame in the ‘70s, leading top rock band Tom Petty and the Heartbreakers. Petty has been on tour to celebrate the 40th anniversary of his band. Last week, the band completed three sold-out shows at the Hollywood Bowl. Tom Petty sold more than 80 million records worldwide, making him one of the best-selling music artists of all time. In 2002, Petty was inducted into the Rock and Roll Hall of Fame. Thomas Petty was born and raised in Gainesville, Florida. At age of 17, Petty dropped out of Gainesville High School to join the band Mudcrutch. One of Petty’s first guitar teachers was Don Felder, also Gainesville resident, who later joined the Eagles. According to Stevie Nicks, the title of her hit song “Edge of Seventeen” came from a conversation she had with Tom Petty’s first wife Jane Benyo. In the conversation about the couple’s first meeting, Jane said they met “at the age of seventeen”, but with her strong Southern accent the phrase sounded like “edge of seventeen” to Stevie Nicks. Music video by Tom Petty performing Free Fallin’. (C) 1989 UMG Recordings, Inc.
Tom Petty – You Don’t Know How It Feels (Video Version/Warner Bros. Records). Tom Petty – Runnin’ Down A Dream DVD Trailer (Warner Bros. Records).